Prepare vegetables. In a greased baking casserole, sprinkle a few croutons. 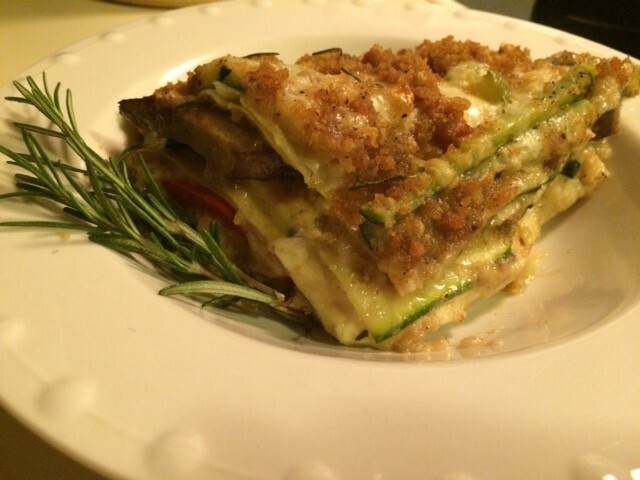 Layer slices of zucchini, salt and pepper, crouton crumbs, tomatoes, salt and pepper, Parmesan, repeat if you have additional vegetables, add mozzarella. Then mushrooms, salt and pepper, crouton crumbs, green pepper, mozzarella, Parmesan, croutons crumbs, herbs if desired. Bake at 350 degrees for 45 minutes. Enjoy!